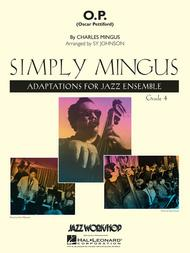 Composed by Charles Mingus. Arranged by Sy Johnson. Simply Mingus for Jazz Ensemble. Jazz. Score and parts. Published by Jazz Workshop, Inc. (HL.7011636). Titled in honor of Charles Mingus' good friend and mentor Oscar Pettiford, this swing chart opens with the two tenors, followed by all the saxes, and finally the entire ensemble. Whether you play this at a medium tempo or as a blazing burner, the result is the same – a unique-sounding chart that swings like crazy.